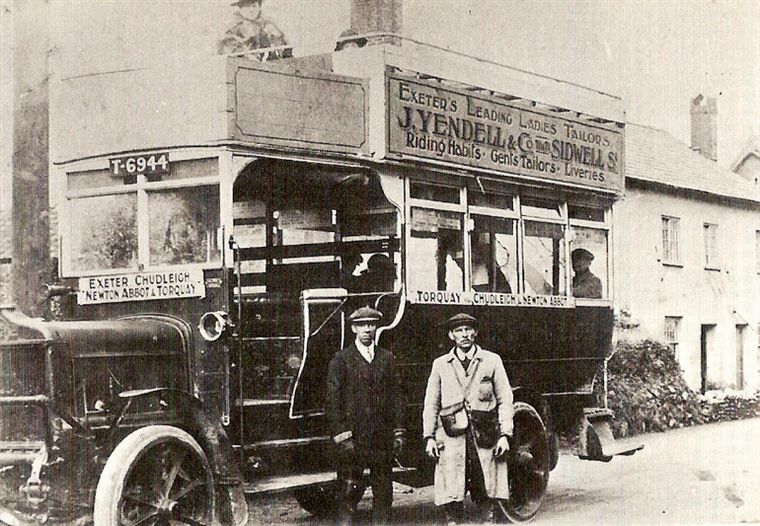 The Devon General Omnibus & Touring Co Ltd was incorporated on 22 May 1919. 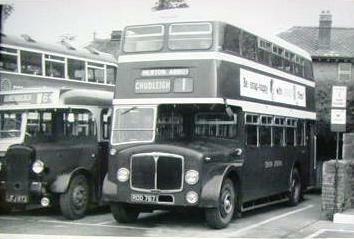 Their first three buses were open-top double-decker type AEC 'YC' originally operated by London General. All three were licensed on 11 June 1919 and given Fleet Nos 1, 2 and 3. The buses were respectively named Sir Francis Drake, Sir Walter Raleigh and Sir John Hawkins. Their registrations being T6942, T6944 and T6946. 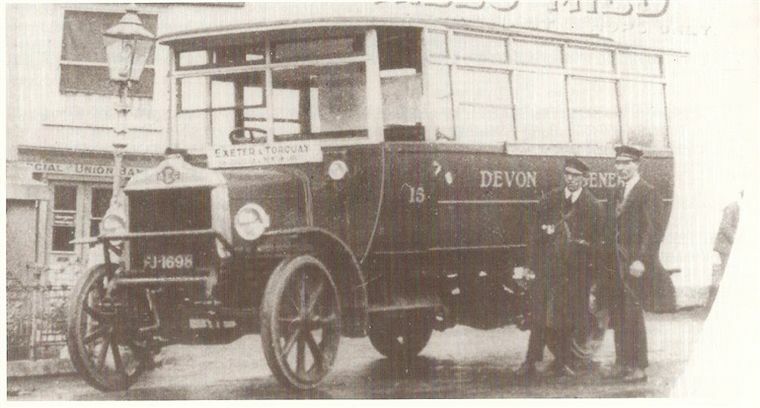 The route that became Route 1 began in July 1919 from the depot in New North Road, Exeter to Newton Abbot via Chudleigh. Their colours were red with white relief, brown wheels and black chassis frames. These three buses were withdrawn in 1930, 1928 and 1932 respectively. The company added further buses to their fleet which totalled eleven by the close of 1920. In 1921 nine buses were registered; all would have been utilised on the Chudleigh route. One in particular FJ1698 an AEC 'YC' was photographed at The Square sometime in the period 1922/23. This particular bus was withdrawn from service in 1927, the others of this group by 1931. The direct route between Exeter and Torquay, via Chudleigh, Haldon Moor and Newton Abbot, through beautiful wood and moorland scenery. From the top of the moor a wonderful panoramic view of Exeter is to be obtained. During the summer months picnic parties cannot do better than to go to the top of Haldon Moor for a day's enjoyment. Passengers travelling from Exeter and intermediate stages change at Newton Abbot for Buckfastleigh (Service 11). On 28 November 1953 an AEC 'Regent', new in 1938, ETT 998, was photographed crossing the A38 near the former Wobbly Wheel Garage, Kennford. Devon General was taken over by Western National on 1 January 1971. Throughout fifty-two years the Chudleigh route remained as Route 1. The service today from Exeter to Newton Abbot is operated by Stagecoach Devon under route number 39.